Reach your highest goals! 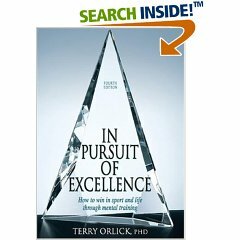 Whether you are an athlete, coach, or want to become a high achiever in another walk of life, In Pursuit of Excellence provides the expert advice and proven techniques to fulfill your aspirations. You'll learn how to develop a more positive outlook, focus your commitment, overcome obstacles to desired outcomes, and achieve greater personal and professional satisfaction. You'll also discover better ways to work with teammates, respond more effectively to coaching, and become more self-directed in your thoughts and actions. Author Terry Orlick, an internationally acclaimed sport psychologist, has helped hundreds of Olympic athletes maximize their performances and achieve their goals. In this third edition, Orlick presents his special insights and experiences to help you make the most of your potential. He also identifies the Seven Essential Elements of Human Excellence and provides a step-by-step plan for proceeding along your personal path to excellence. Both practical and inspirational, In Pursuit of Excellence is a guide to daily living and motivation, as well as a road map to long-term achievement. Read it, use it, and win‚on and off the field.